The first South Carolina-built 787 moves to Final Assembly Position 3 early in the morning of 18 December, shortly after achieving 'weight on wheels' for the first time. The aircraft moved on its landing gear, via tug, to the next production position where electrical, hydraulic and mechanical systems installation and testing will continue over the next several weeks. Installation of the aircraft's engines and interior will begin soon. 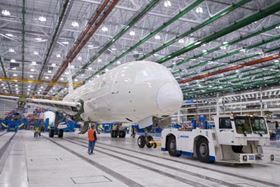 Boeing South Carolina remains on schedule for its first 787 Dreamliner delivery in the first half of 2012. To achieve weight on wheels just 24 months after breaking ground on this new facility is incredible. This is a great testament to what can be done when a well-trained, knowledgeable and highly motivated team focuses on a common goal. At full production rate, the North Charleston final assembly facility in South Carolina is expected to produce three Boeing 787 Dreamliners per month. Around 50% of the primary structure of the Dreamliner (including the fuselage and wing) is be made of composite materials.